Replacing an old, leaky or damaged tub drain in a mobile or manufactured home can be different from a tub drain in a standard site-built home. Mobile homes often have "garden" style tubs that do not have an overflow tube, and the drain includes just a seal and nut that you tighten onto the tub itself. In a standard home, the drain assembly is usually a threaded insert onto which a mounting nut is screwed from below. Most garden tubs have drain fittings that are removed from the top of the tub. This can be replaced with a new drain fitting that is secured with a retaining nut on the bottom side of the tub. Use a tub drain wrench (sometimes called a Dumbell wrench) to unscrew the drain fitting counterclockwise, levering the wrench against the crosshairs inside the drain fitting. If the fitting is stuck or the crosshairs break, cut the fitting with a mini hacksaw or a hacksaw blade. Cut through the threads and the rim of the fitting but not deep enough to go into the tub itself. Make a second cut about a 1/2 inch away from the first cut. Pry out the cut segment with a flat screwdriver, then use the screwdriver to pry up one of the edges of the drain fitting and unscrew it counterclockwise. Prepare the new drain fitting and the drain pipes for installation. Beneath the tub, locate the drain trap secured by a nut. Loosen the trap nut and move the trap and drain pipes out of the way to make room for the new tub drain. Move to the top side of the tub. Roll out an even bead of plumber’s putty and position it around the new drain fitting. Push the fitting into the drain opening in the tub. Go back under the tub. Push the rubber seal, followed by the retaining nut, onto the tailpiece of the drain fitting. Screw on the nut until the fitting is tight. 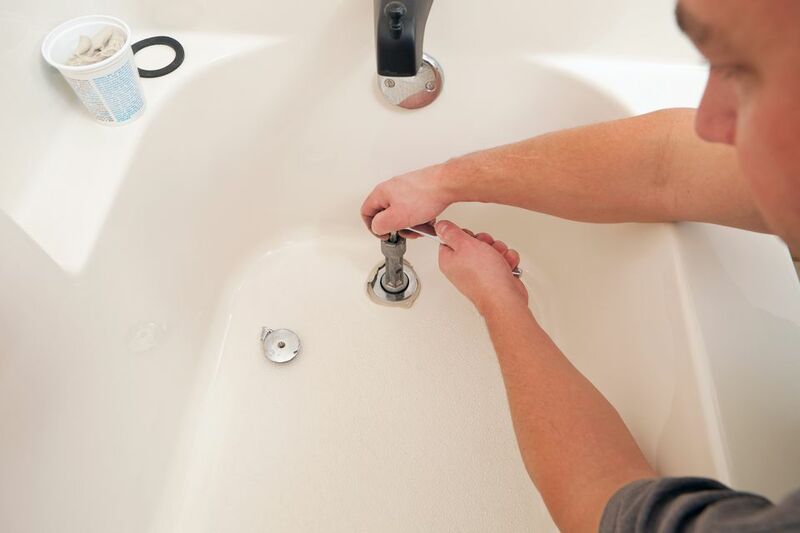 If the drain fitting spins instead of tightening, you may need a second set of hands to help hold it in place from above the tub while you tighten it from underneath. You can also use the tub drain wrench to hold the drain fitting in place as you tighten the retaining nut. Install the rest of the tub drain pieces onto the new drain fitting. The fittings required may vary but often include using a 1 1/2-inch female adapter that is screwed onto the drain tailpiece, using plumber's tape on the threads for a watertight seal. You may need additional pipes and fittings to complete the connection. Whenever possible, use trap and pipe pieces that are all the same diameter to help the tub drain faster. Finally, tighten the trap nut. Have a helper fill up the tub and drain it while you watch for leaks from below. An alternative method for replacing a tub drain is to use a flanged tailpiece and a 1 1/2-inch tubular trap with a trap adapter to convert back to the 1 1/2-inch drain pipe. This type of trap includes slip-joint washers that are easy to use and are similar to those used on kitchen and bathroom sink drains. This alternative option makes it easy if you are having trouble lining up or connecting the tub drain in any way. However, one potential problem with using 1 1/2-inch tubular pipe is that the tub will not drain quite as fast because it is a smaller pipe. The drain also needs to be in an accessible location, since these are mechanical joints that can leak more easily than glued joints. Also, if you attempt to snake the drain from the tub, the thin tubular trap can break. To prevent this, you can remove the trap from underneath the tub and snake the line from there, if necessary.